Looking for an atypical theater experience in New York City? While Broadway is certainly worth your time, it’s far from the only entertainment option. Whether you’re craving knee-slapping comedy, show tunes, a space with a great back-story or something truly immersive, you can find it within New York’s five boroughs. To help your quest, we’ve rounded up five truly unique NYC theaters to help you go beyond the obvious. Hint: Before purchasing tickets to any of the below theaters, check Groupon, Living Social, Goldstar and Fever to see if there are any deals going on. Forget what you thought you knew about theater. Sleep No More is a truly immersive experience; as in, you’ll don a mask while traipsing about the makeshift McKittrick Hotel, following characters from a macabre version of Macbeth from room to room. If you go with a group, you’ll likely get separated. And when you regroup for a cocktail at the 1920s-themed attached Manderley Bar cocktail bar — which you can retreat to at any point during the “show” — you’ll each have had totally different experiences based on who you followed and when. Pro tip: Book in advance, as Sleep No More tends to sell out. Also, make sure you’re there for the very surprising ending. This Upper East Side comedy staple has had myriad notable comics grace its stage: Sara Silverman, Eddie Murphy, and Adam Sandler. In fact, it’s where Jerry Seinfeld got his start — and is the comedy theater featured on his Netflix special, “Jerry Before Seinfeld”. In the lobby, you can peruse the hundreds of signed headshots of your favorite comics who have been in the very room you’re about to enter. Comic Strip Live’s bread and butter is stand up comedy, and you’ll typically see four acts per show. There’s a two-drink minimum per person, though it’s also recommended to order a bowl of their tasty popcorn. They offer shows seven nights per week, so you’ll never have to worry again about what to do on a Monday night. Theatre 80 — which also boasts an absinthe bar, hot dog stand and the Museum of the American Gangster — was a nightclub during Prohibition. It was owned by a Bavarian gangster named Frank Hoffman, who made millions through his bootlegging operation. Sadly, but not surprisingly, Hoffman and his girlfriend were murdered by their bodyguard while trying to move a large sum of money out of the club. But, not all of it. A playwright named Howard Otway purchased the building, and wanted to build a stage to house a theater. As he was gutting the space, he came upon two safes. Not sure what to do, he asked the man whom he’d purchased the building from — who himself was affiliated with gangsters — to open the safes with him. When a few million dollars were found inside, you can probably guess who kept the cash. The good news: Otway was the first to put on “You’re A Good Man Charlie Brown” in 1967, which put Theatre 80 on the map for Off-Broadway theater. Today, you can see everything from satirical takes on pop culture (think a dose of Zack Morris in “Bayside”) to cultural shows combining Celtic music performances with dance lessons. Greenwich Village is known for its performance history, from legendary live jazz (hey hey Village Vanguard) spaces to rock-and-roll joints that made legends (like Cafe Wha?, where stars like Bob Dylan and Jimi Hendrix got their start). 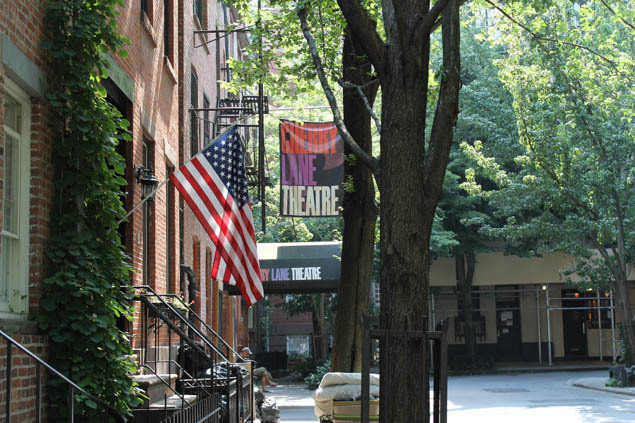 Another notable space in this neighborhood: The Cherry Lane Theatre. The theater resides in a landmarked building that was once a brewery in 1836; and even before that the land was home to a farm silo in 1817. After a few other lives, the space finally became a theater in 1924; opened by a group spearheaded by Pulitzer Prize winning poet Edna St. Vincent Millay. Today, the theater holds the title of “New York's longest continuously running Off-Broadway theatre” (which means it seats between 100-499 people; compared to Broadway which seats 500 or more). At Cherry Lane Theatre, you might see a revival of a past production through their Heritage Series, or a never-before-seen piece from a new artist through their Discovery Series. A few of the many big names that have graced the stage include Barbra Streisand, James Earl Jones and Bruce Willis. In Manhattan’s Hell’s Kitchen neighborhood resides Ars Nova, an Off-Off Broadway Theater — which means it seats less than 99 people — focused on showcasing emerging talent. No idea is too “out there” or envelope pushing, so be prepared for some eccentric, perspective-shifting shows, which range from puppet productions to poetry readings to dramas and beyond. In fact, some of their performances have been so well received they eventually made it to Broadway, like Natasha, Pierre & the Great Comet of 1812, while a few of their other shows have turned into national and worldwide tours. What’s really neat about this stage: It’s so intimate you’ll feel like you’re watching a performance in your living room. Now, you certainly won’t find THAT on Broadway.